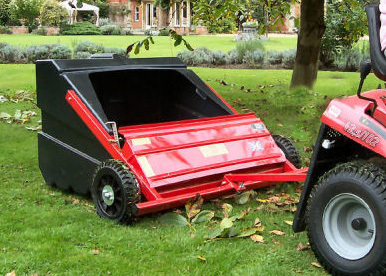 The TS98 lawn sweeper is robust in construction to withstand prolonged heavy use . A differential mechanism on the brushes allows the sweeper to be manoeuvred in tight corners without the wheels scuffing. The differential mechanism also allows both ground wheels to drive the pick up brushes giving it superior sweeping power . The height adjustment is simple . The main drive is transmitted via metal gears . The large capacity solid plastic catcher is rot and tear proof and simple to use . Reversing into the tipping heap is always difficult but it is made easier with the TS98 as it only has two wheels in contact with the ground. The sweeper may also be used for hard surface sweeping . To achieve the best results a rubber strip should be fitted at time of manufacture . SCH products sold by us are supplied ready for use and delivered using an individual service rather than a parcel/pallet carrier. Delivery will be made in approximately two/three weeks, however we will try to deliver as soon as possible. You will be contacted by telephone prior to despatch to arrange a day and time for delivery. Our price includes delivery to most mainland UK destinations. An additional charge may be payable for delivery to some Highland and remote locations. Please contact us on 01603 738635 with any questions.